sheesh so much for the writing project. no i haven't forgotten about manny... i just haven't had time to update and think about it. school's been nuts and when you're churning term papers, you don't really feel like typing much after that. but summer is coming up, and i'm bursting with ideas. so see you after finals i guess. he believed she hadn't left him up here on purpose. of course, she was a psychology major, she supposedly could read minds, but he wasn't anywhere close, he didn't even take psychology. but he believed she hadn't just abandoned him for no rhyme or reason. she must have forgotten. it must be the finals, he thought to himself. he knew what it was like. finals just mess up you head. he remebered what he'd done during his finals. he'd left his bananas in his locker for the entire exam week, and that had resulted in a major clean up, plus a vast extermination of the fruit flies that had gotten attracted to the sweet smelly decay. this had happened before. the last manny got left up on a similar shelf, he was on top of the money holder. but she had been back in a jiffy. today, it was just a little bit too long. alright, maybe not a little bit too long, just too long. manny sighed out loud. he didn't feel like grinning anymore. he was just worried that he had been... permanently forgotten. encoding failure, as she had told him while reading a chapter for psychology class. out of sight, out of mind, as manny knew it. it had been this way with his bananas in the locker. as everyone knows, with worry comes fear. manny began to contemplate about his future. where would he end up? whose monkey would he become? what would be his new function? would another psychology major pick him up (he was beginning to like all the things she had been reading so far, especially the chapter about children and growing up)? most importantly, is she coming back soon already? just as he wanted to get started on answering those questions (he never liked rhetorical questions, unlike her), the door swung upon, and manny's heart began to rise. she came back after all! she did remember anyway! a tad bit long, he'll make her pay for the long time of worry, by ignoring her for a while. but she was back! 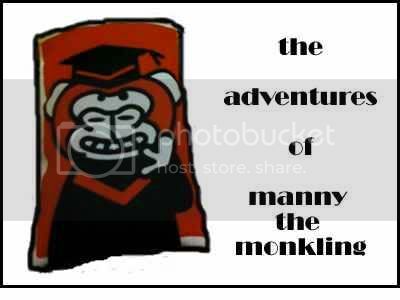 but as manny was lifted off the shelf, he stole a glance at her. it was most certainly a her. but it was a different her. the hair was longer. and she wasn't wearing her favourite green shirt. in fact, the shirt was shocking pink, a colour she usually associated with the terms 'bimbo' and 'dumb blonde' (he chuckled at the thought, he totally agreed with the associations). she spoke, "well what have we here?" speaking, she left the tiny cubicle. she took out the contents manny held. it had been manny's her's most prized and recently acquired techonological possesion. then without another word, the strange she tossed manny into a strange flap, and quickly left the room. throughout the empyting of his pouch, manny had shut his eyes tight. now he opened them. and he saw nothing. it was dark. he couldn't even see his hand, as he raised and waved it in front of his face. he was in a strange dark place that didn't smell as good, and he had no idea how he was going to get out. not forgetting he had lost the precious contents that he held so tightly, having been entrusted by her best friend the elf to take care of. manny was stuck, smelly, dirty, alone and scared. alright, this will come soon enough. i just settled all the html, and i'll be away till Christmas. so no posts till i'm a little more free i guess. manny was 26 days old when he got left alone on a shelf for 30 minutes and then disappeared. this serves as a contemplation as to what happened to him after his disappearance. it is also a form of catharsis for the author, who holds the primary responsibilty for his disappearance, and is still kicking herself for it.